Melbourne is preparing for the Lonsdale Street Greek Festival, its biggest street party and longest-running Greek celebration, which will be held the weekend of February 23-24, according to greekreporter.com. The festival will bring together some of Australia’s most gifted performers, dancers and chefs for a weekend of Greek-flavored entertainment. The historically Greek district will be chock-full of things to do and see, with 80 stalls, four free entertainment stages, two bars, cooking demonstrations, children’s rides as well as other activities. Headlining the event will be one of Greece’s most popular singers, Eleonora Zouganeli, on her first visit to Australia. 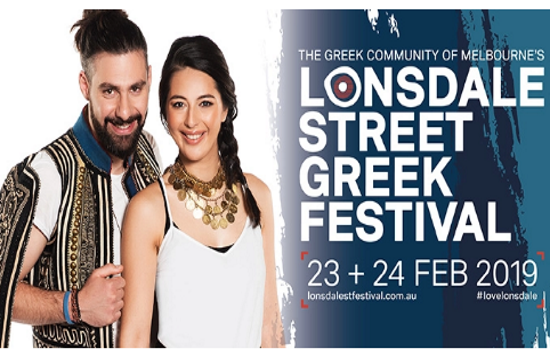 Since 1987, the Lonsdale Street Greek Festival festival (which was formerly known as Antipodes) has taken over Melbourne’s historic Greek area to mark the best of Hellenic culture. Over the years, thousands of performers and dancers have taken to the street to showcase the best in traditional and modern Greek dance, while hundreds of competitors have tested their endurance at the “Zorba ‘Til You Drop” dance contest in hope of winning a trip to Greece. Some of the most talented performers in Greek entertainment, including Glykeria, Giannis Haroulis, Michalis Xatzigiannis, Alkinnos Ionnidis, and Pandelis Thalassinos, have kept the crowd dancing in the street into the early hours of the morning. The festival expanded last year, and it now extends from Swanston St. through to Exhibition St., boasting four performance stages and yet more food and fun for people to savor.